What’s the cost of an open access book? In order to establish a viable funding model for Open Access publications, one has to know the costs attached to creating an article or a book. The sums quoted vary wildly, between 10 USD and 40,000 GBP for an article, and 1000 EUR and 25,000 EUR for a monograph. In order to shed some light on the issue, we will share our data relating to the publication of monographs. We are currently funded by the DFG with about 580k€ for a two year period. As a first approach, one could take the sum for one year, i.e. 290k€ and divide it by the number of publications, 9 to day. This leaves us with around 30k€ for a book. However, looking more closely at the funded items, the truth is that there is only one person running the publishing business (the coordinator), helped by one economist, one web developer, one sys admin and one computer scientist doing R&D. All this is surely important, but the daily routine of publishing books could be handled by the coordinator alone (+ one student assistant). This is currently a 80% position, which costs the employer about 60k€/year plus the student assistant (6k€/year). This gives us a sum of 7,500€ per book. On the other hand, we are still in the initial phase of setting up shop and a number of processes still have to be explored and established. Once this is done, work time will be freed to allocate towards book production. Repartition of costs among coordination (right) and everything else (left). We arrived at the figure of 7,500€ starting from the gross sum and dividing it by the books. In order to calculate the average costs in future one can also take the other direction and start from the individual tasks. Per-book costs have to be distinguished from overhead. We made a rather detailed breakdown of these for our internal calculations. 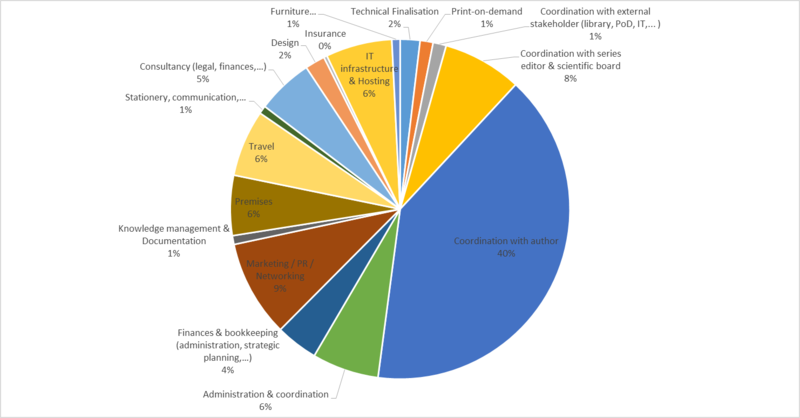 The diagram above shows the repartition of costs for 48 books a year.We see that coordination with authors and series editors make up about half of the costs. The running rate is 195.25 emails from initial publication to print-on-demand delivery per book for the coordinator alone. This includes dealings with authors, series editors, fontsmiths if necessary, and various service providers and repositories. The rest is split more or less evenly among a dozen other items or so. This also means that any efforts to reduce the cost should target the communication overhead by providing better guidance through manuals, screencasts and an intuitive workflow. Still, monographs and edited volumes are very much tailor-suited works where a lot of consultation is needed to find the best way to present the content. As a consequence, a reduction of the coordination efforts is not obvious. For the 48 books assumed, we arrive at a total cost of 160,000€/year, net costs per book clocking in at about 3,300 €. Included are personnel costs equivalent to 378 working days at different salary levels and overhead such as office space, equipment etc. The rate can be reduced further by increasing the output, but not much. So 3,300€ is probably the lower bound, while we are currently somewhere in the range of 7,000-8,000€. The obvious question: who will pay? Readers, as in the traditional model? Authors, via book processing charges? Libraries, as with OpenLibHums? The state? The crowd? 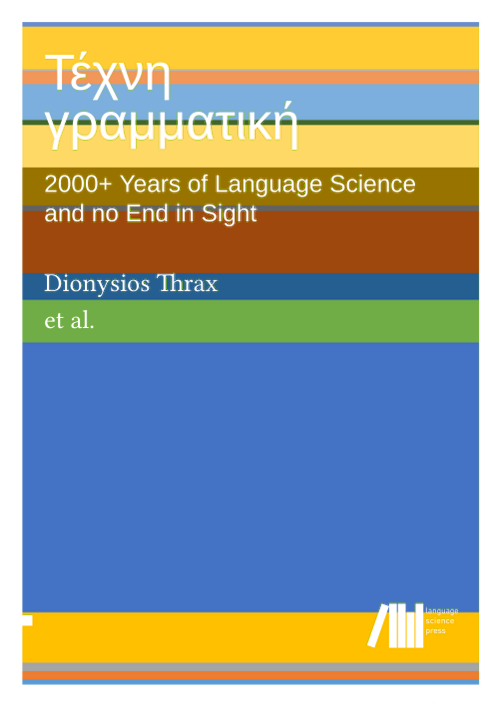 Whatever the repartition among those sources: it will have to be about 3,500€ per book. If only one source is targeted, administration overhead will be minimal. More realistic, however, is a mix of different sources of revenue. These come with their own overhead in administration, accountancy, and legal paperwork. If you have to deal with bank transfers from South African universities, donations from Austria, authors paying in Brazilian Reais and PoD margins in Pound Sterling, the number of processes to be established and legal pitfalls to be avoided quickly multiply. Is this desirable? Which would be the right mix of sources of revenue? And what are the political and sociological implications of the options chosen? Stay tuned for future blogposts right here! This entry was posted in business model by Sebastian Nordhoff. Bookmark the permalink. When I wrote the book “Natural Causes of Language”, which was published by LangSci Press in 2014, the costs stated in your pie chart above were not the only ones. On top of the costs that the press paid for the various things in the chart, there were significant costs that I paid, in the form of (1) the time and work of doing the writing itself, of course, but also (2) the time and work of learning and implementing the typesetting software (LaTeX) required for submission, as well as (3) cash outlay for research assistance, helping with the same. I have not calculated these costs, but it would be well over the 3000+ euros cited above ‘what it costs to publish a book’. Any potential author must have a way of covering these costs themselves, independent from those to be paid by the publisher once they have received the fully-written and properly formatted manuscript. So the question has to be asked a second time: Who will pay? I updated the post to make it clearer which costs are treated here. For this post, I consider a submission in LaTeX according to the LangSci guidelines. Creating this submission in the first place also requires effort. As Nick notes, these costs are often hidden in the researcher’s salary, although they may become more visible when a research assistant has to be paid, or when an external service provider is hired (Language Science Press can facilitate contact to such service providers). This obviously still excludes an even bigger factor: the time to do the original research in the first place, before the first word is ever written. One could imagine an argument that this cost should also be factored in (I am not necessarily in favour of such an argument, though). The one constant is change. There will be new software, new file formats, new book layout challenges, new web design challenges, new production challenges, new funding challenges, and new communication challenges. It is always tempting to think that the work will get more efficient over time and that your setup costs can be amortized for many years into the future. The investment you make today in creating a smooth workflow and efficient processes is important, but it is an investment you will have to make over and over as time goes on.